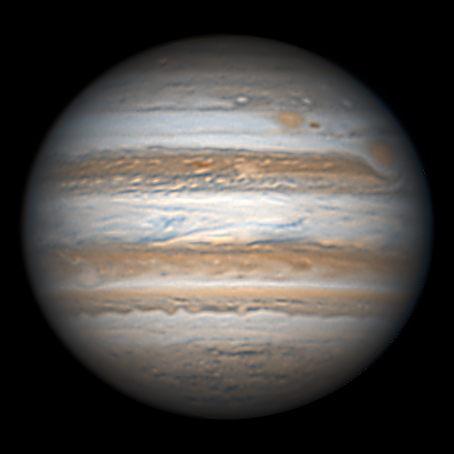 Jupiter is the largest planet in our solar system and is a fascinating world of ever changing features. Its vast gaseous atmosphere offers much to see through the eyepiece of a telescope. 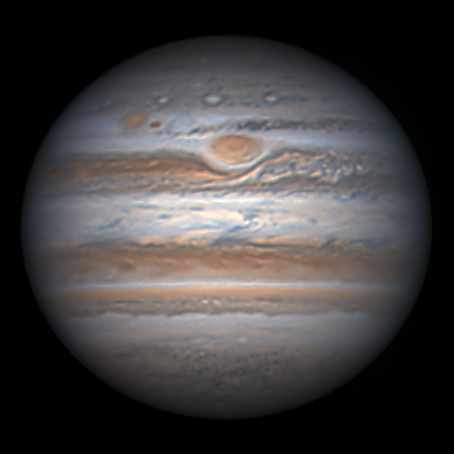 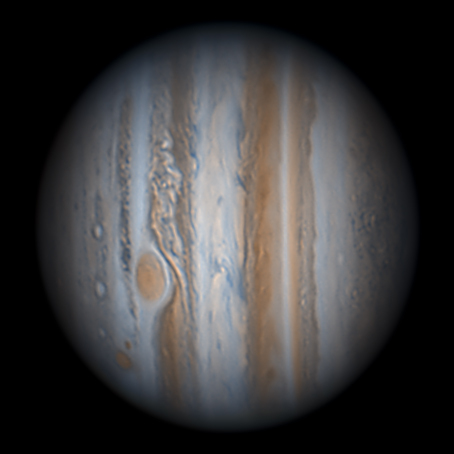 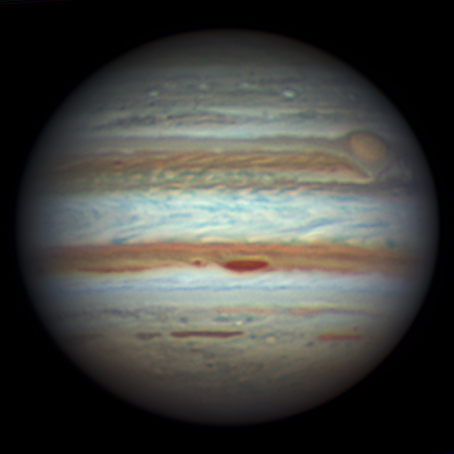 The Great Red Spot has been quite a striking colour in recent years, so has the NEB and NTB. + Baader UV/IR rejection filter 23:38.5 UTC (all derotated combinations in WinJupos). 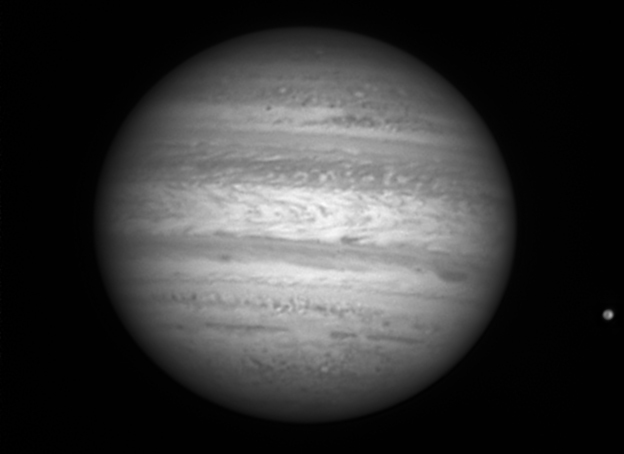 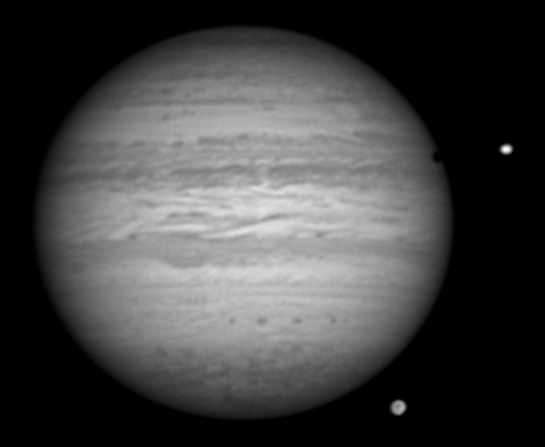 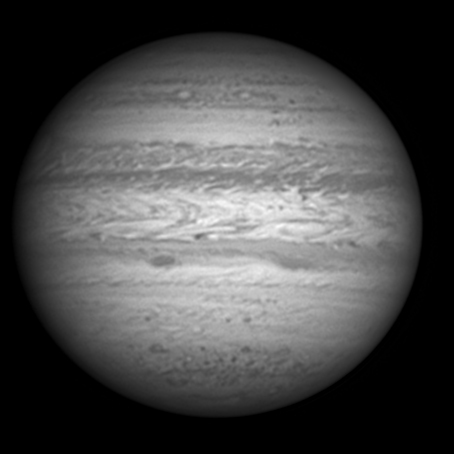 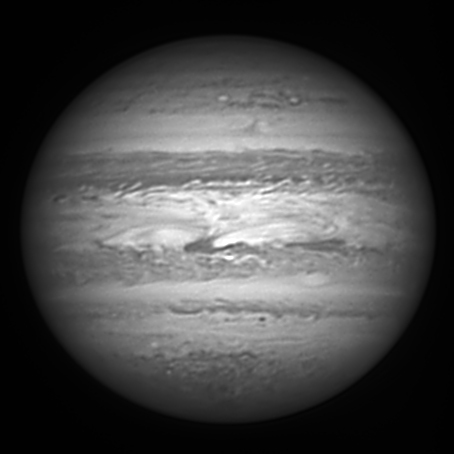 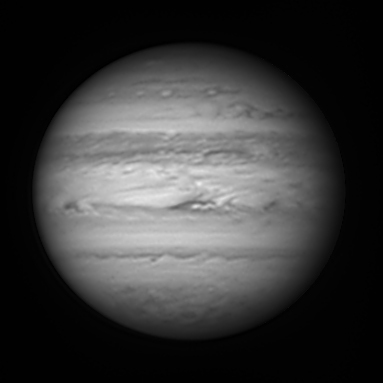 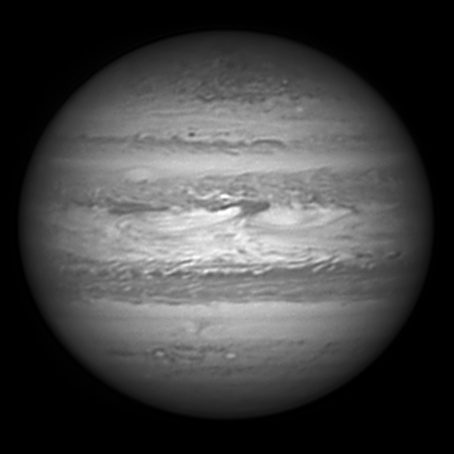 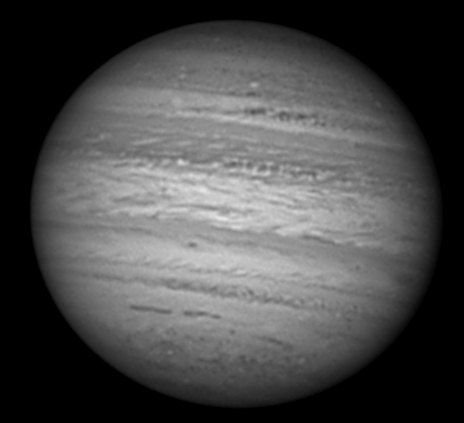 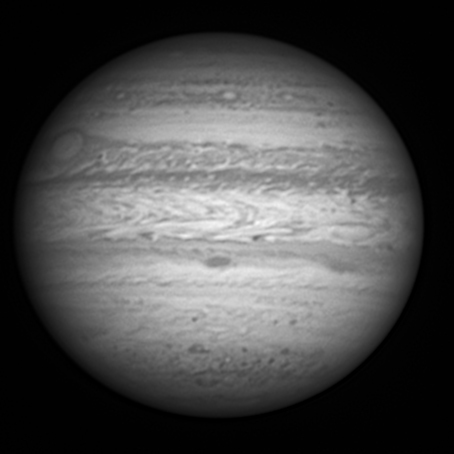 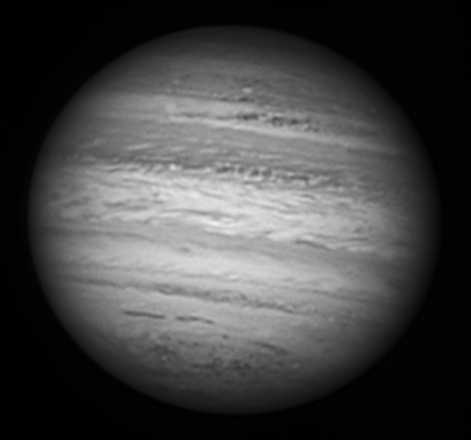 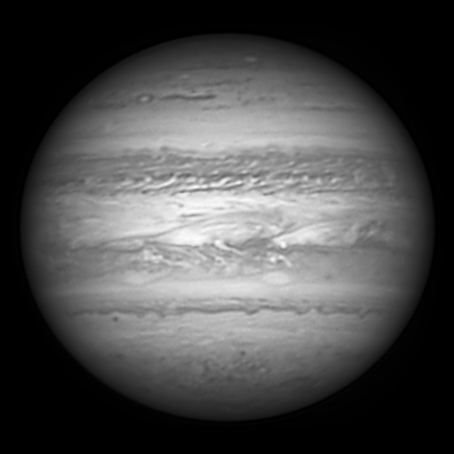 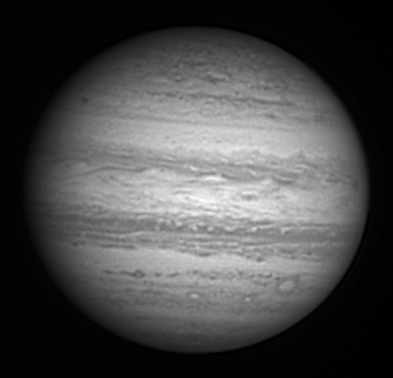 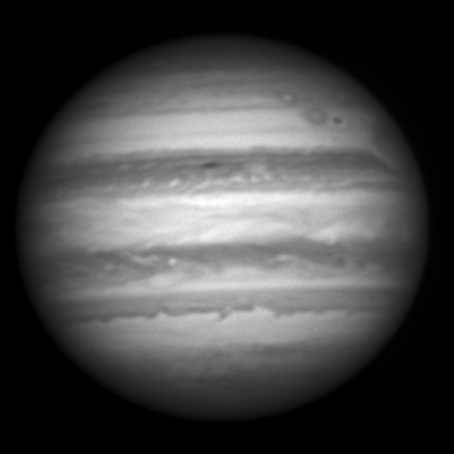 + Baader UV/IR rejection filter 21:51.8 UTC (all derotated combinations in WinJupos). 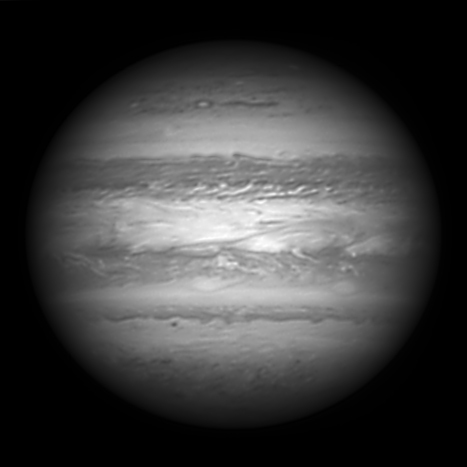 + Baader UV/IR rejection filter 01:53.1 UTC (all derotated combinations in WinJupos). 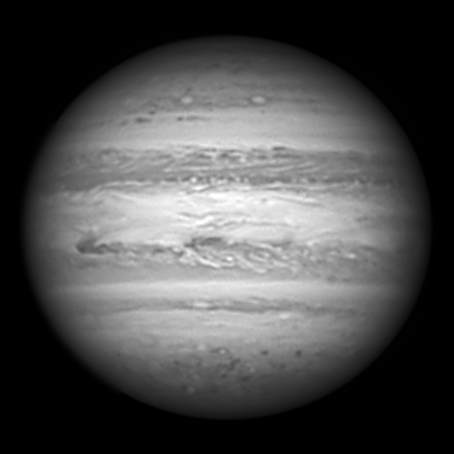 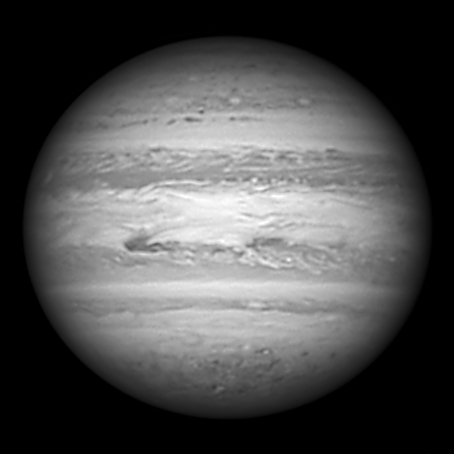 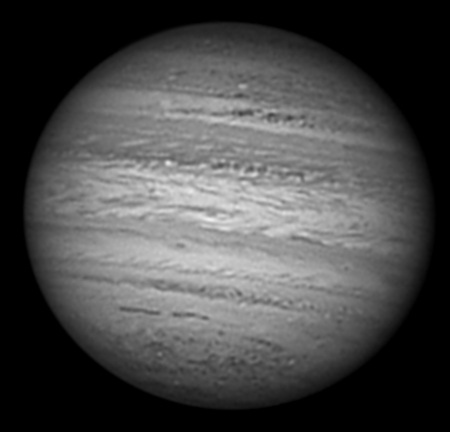 + Baader UV/IR rejection filter 00:06.8 UTC (all derotated combinations in WinJupos). 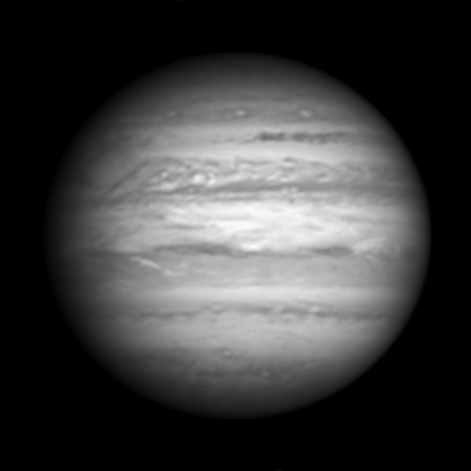 De-rotated combination of 4 R/I.R., 1 G and 1 B video sequences; RGB combination. 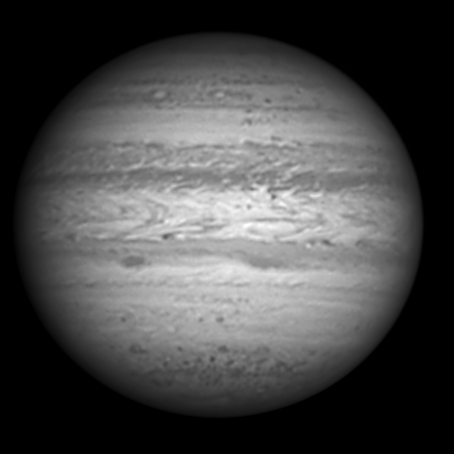 De-rotated combination of 4 R/I.R., 2 G and 2 B video sequences; RGB combination. 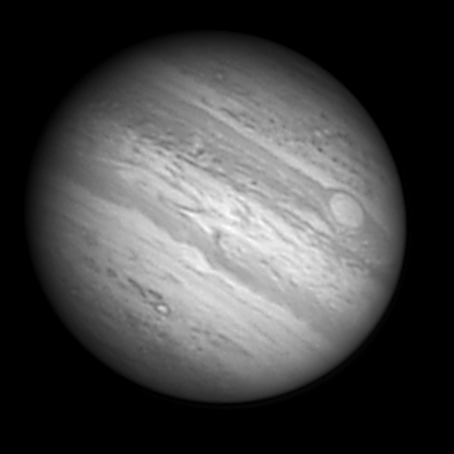 accentuates the non-spherical nature of this rapidly spinning gas giant. 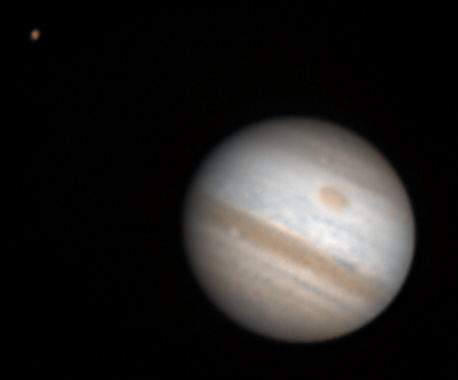 RGB de-rotated combination and R de-rotation shown above. 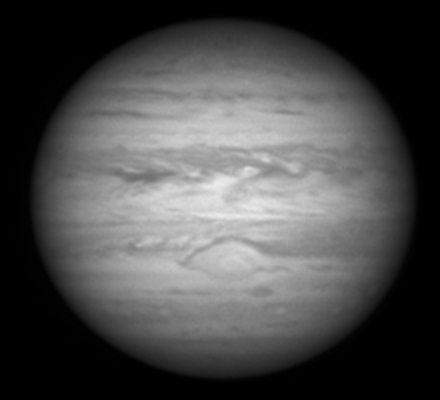 spanning the period from 20:45 - 21:01 UTC. 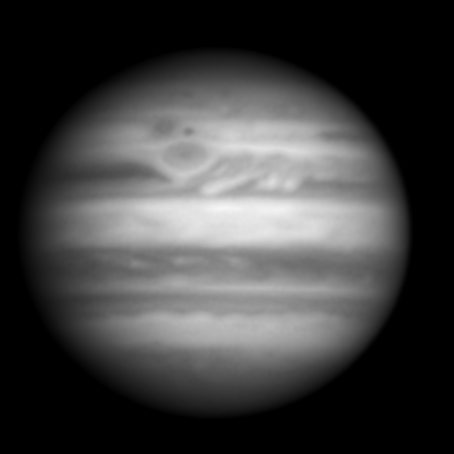 Separate R, G and B shown beneath: centred on R = 20:53.3 UTC; G = 20:52.1 UTC; B = 20:53.7 UTC. spanning the period from 21:02 - 21:32 UTC. 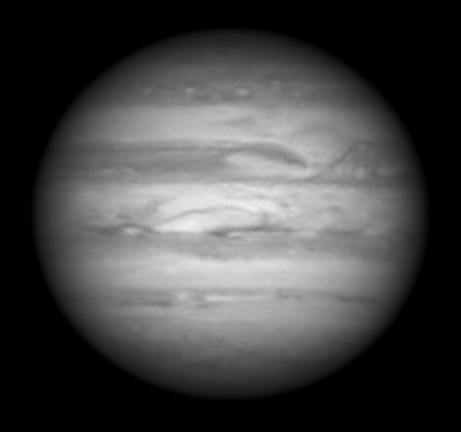 and R (01:01 UTC) shown too. 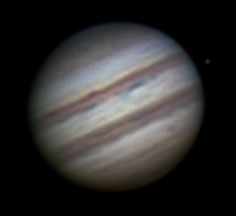 RGB centred on 19:36.9 UTC and separate R, G and B shown. 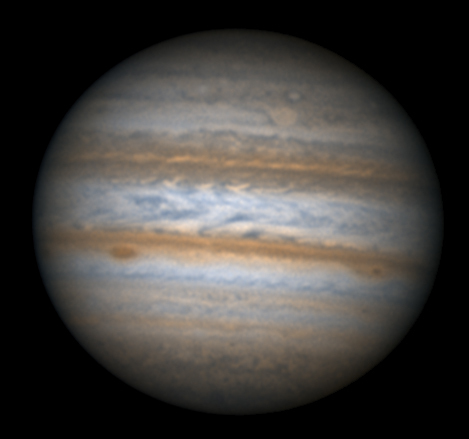 right 20:50.1 UTC combination of two sequences in WinJUPOS. 3D Jupiter illusion! 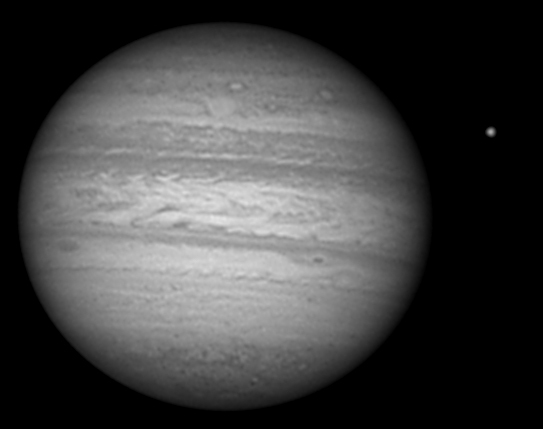 Try crossing your eyes to merge these images and hey presto! 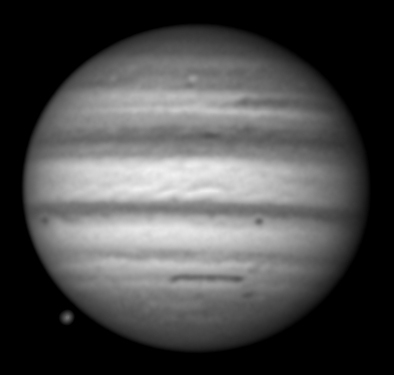 separate R and B shown. 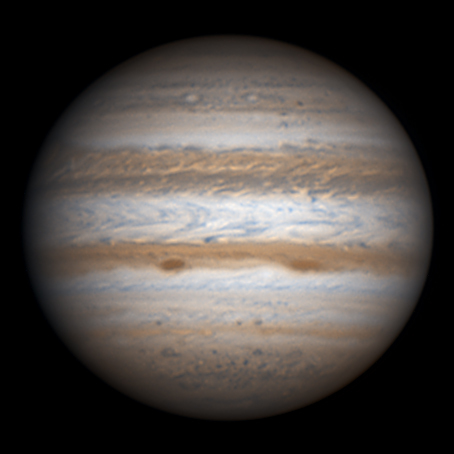 Each colour channel composed of sequences derotated and combined in WinJUPOS. 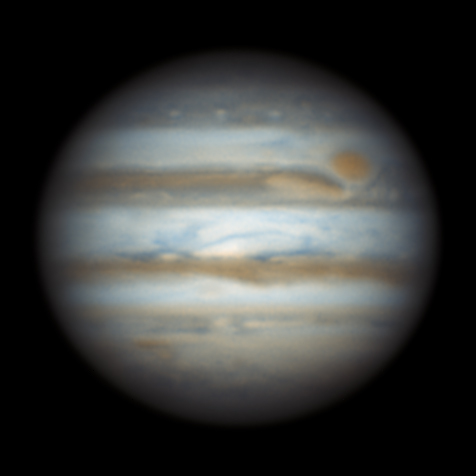 separate R, G and B shown. Each colour channel composed of sequences derotated and combined in WinJUPOS. 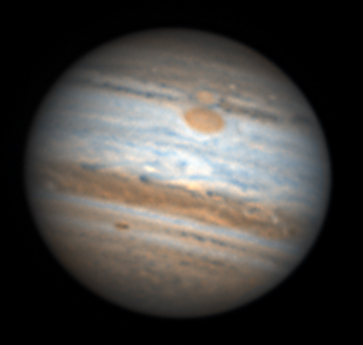 derotated and combined in WinJUPOS. Nice and 'moody' version, with north upwards, normal orientation below. 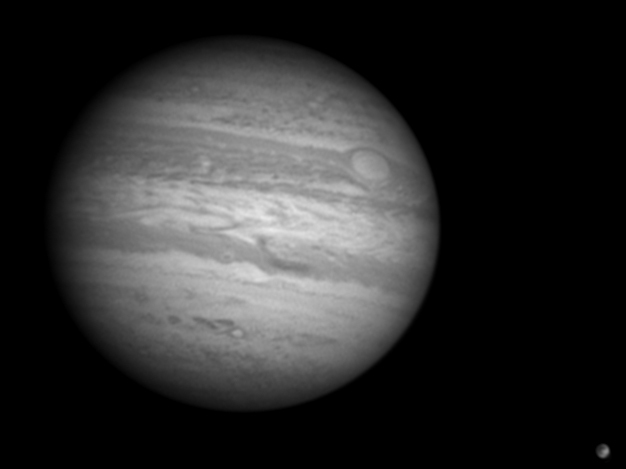 Weirdly, this way up Jupiter appears to me to be tilted with its top towards me. 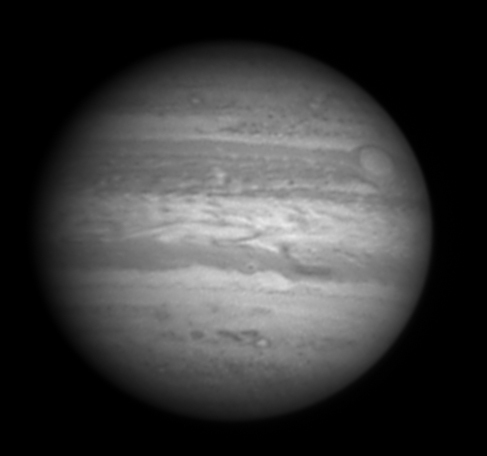 Ganymede showing surface detail and its shadow cast on the upper cloud deck of Jupiter. Great Red Spot near left edge. C14 with x2.5 power mate @ f/27; PGR Flea 3 CCD; seeing 4/10. Trutek Type 1 R filter. 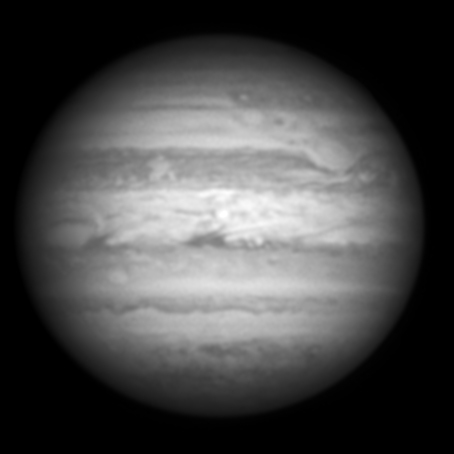 on 00:43.6UTC and separate R, G and B shown. 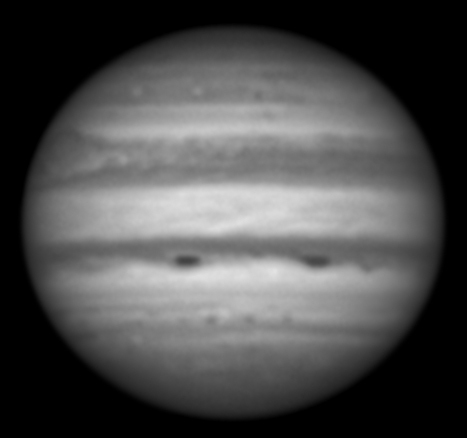 R(G)B centred on 00:32.7 UTC with separate R, and B shown. De-rotated in WinJupos. 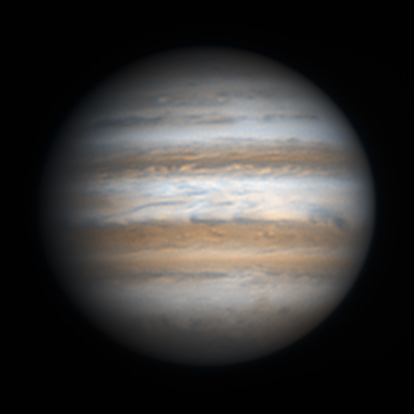 the renewed NEB into the EZ. 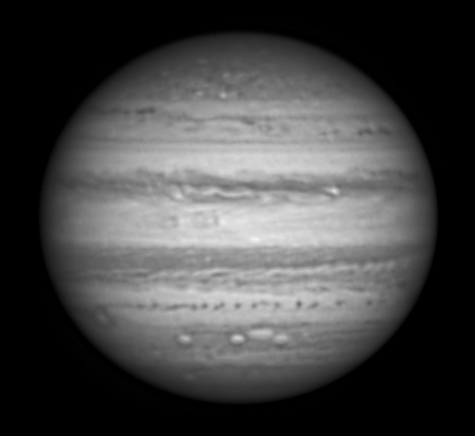 R(G)B and separate R, G and B shown. De-rotated in WinJupos. 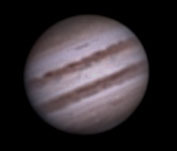 C14 with x2.5 power mate; PGR Flea 3 CCD; quite good underlying seeing. 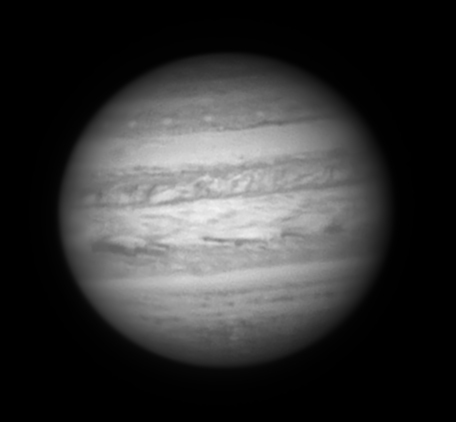 channels shown below the colour image. 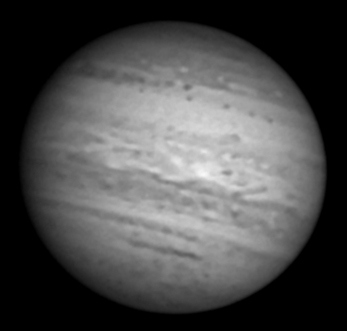 Notice the distinctively pink spot towards upper left. Oval BA appears near CM. 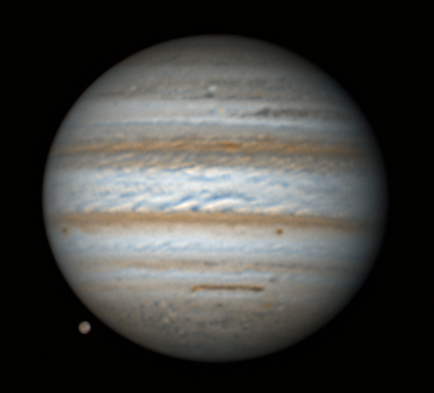 Europa also shown. 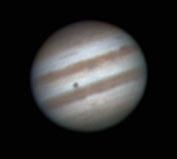 Oval BA appears pale pink as it rotates towards CM. Oval BA approaching C.M. Notice how narrow the NEB is. Great Red Spot about to rotate around the left hand edge. 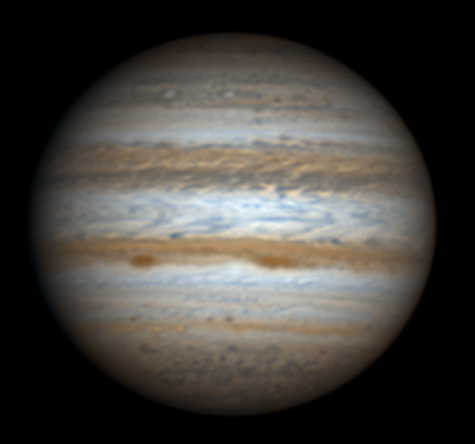 R =22:55 UTC; B = 22:56 UTC; R[60%]R[G]B. 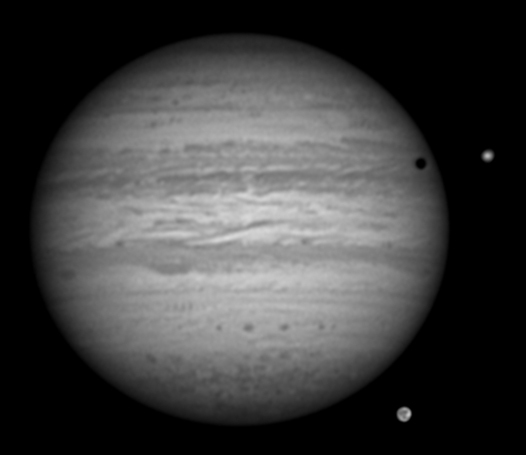 Separate R and B channels also shown. C14 with x2.5 power mate @ f/27; PGR Flea 3 CCD; quite good seeing. 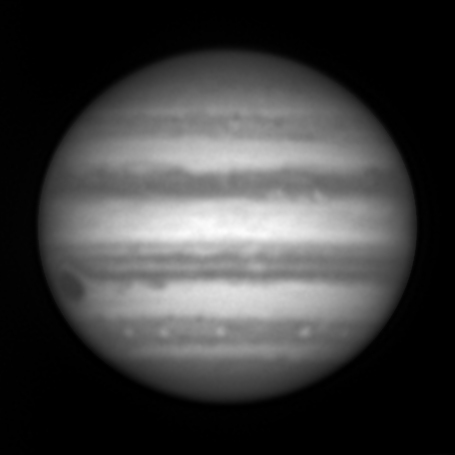 C14 with x2.5 power mate @ f/27; PGR Flea 3 CCD; pretty good seeing. R(G)B; Trutek Type 1 R, B filters (Baader UV/IR rejection filter added to B). Separate R (02:35.9 UTC) and B (02:48.8 UTC) channels are shown too. Great Red Spot just past the CM. 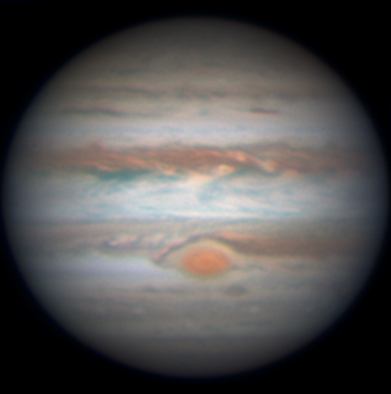 Great Red Spot close to the CM. 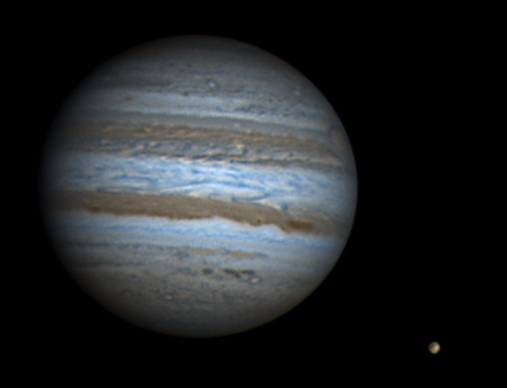 twice as two very different versions). 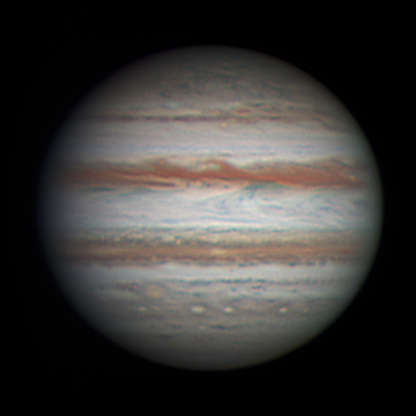 Just look at the vivid red hue on the barge! 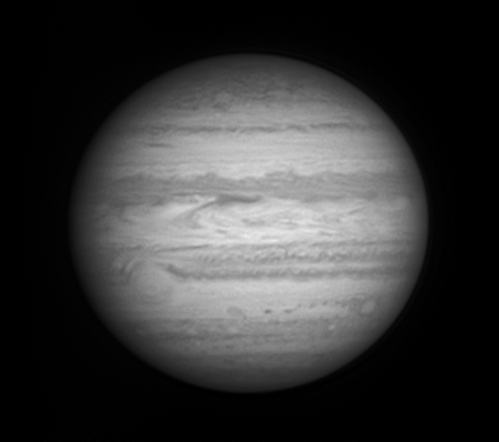 RGB; Trutek Type 1 R, G, B filters (Baader UV/IR rejection filter added to G, B). 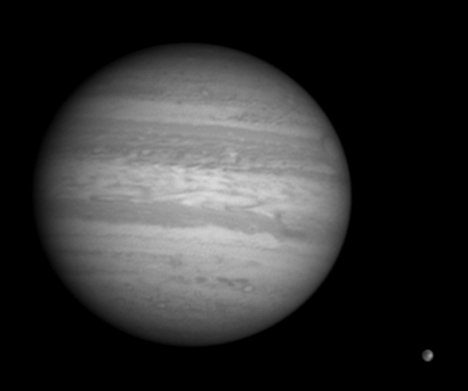 Separate R (01:10.2 UTC), G (01:09.7 UTC) and B (01:09.0 UTC) are shown too. 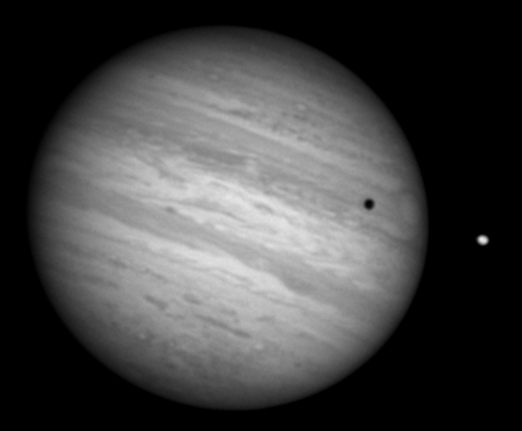 see a dark surface detail on this moon). 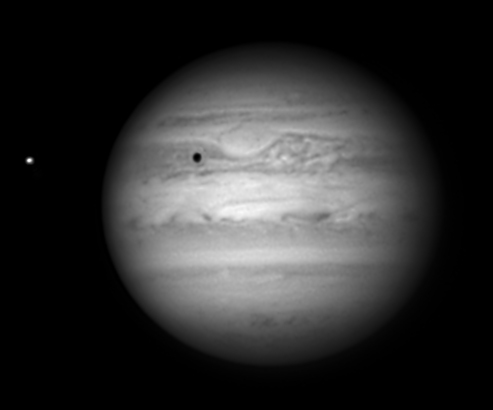 Oval BA above and to left of Io's shadow. 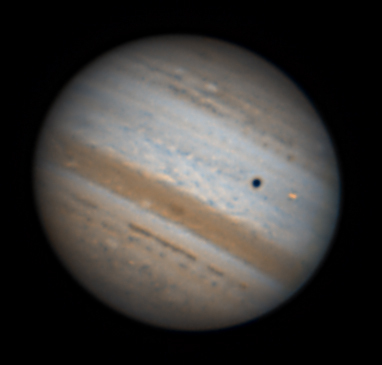 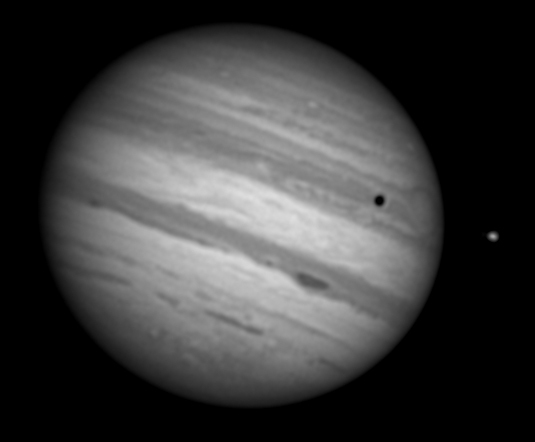 Io's shadow just biting into the disk of Jupiter. 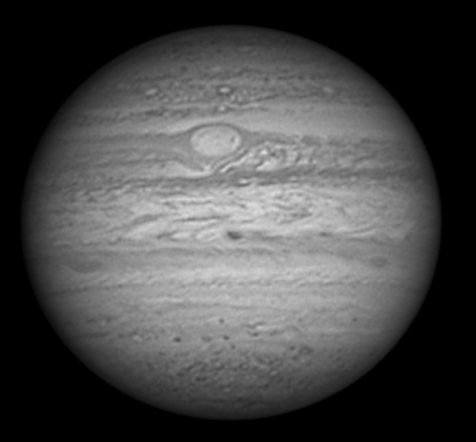 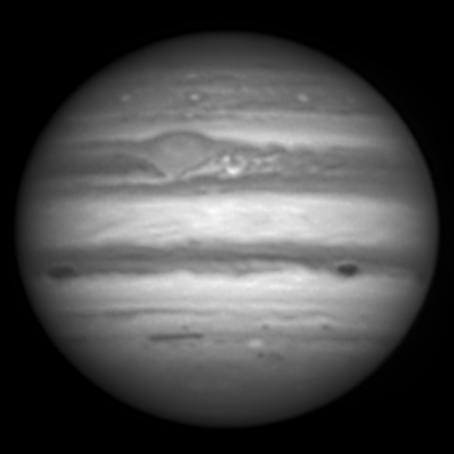 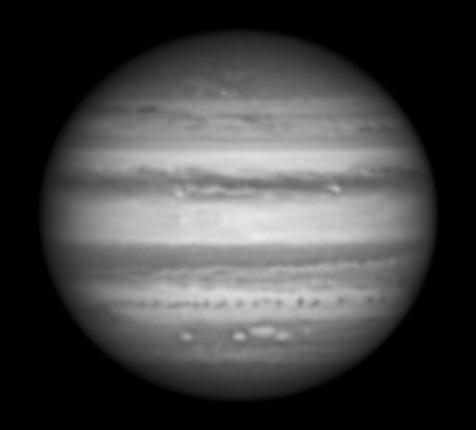 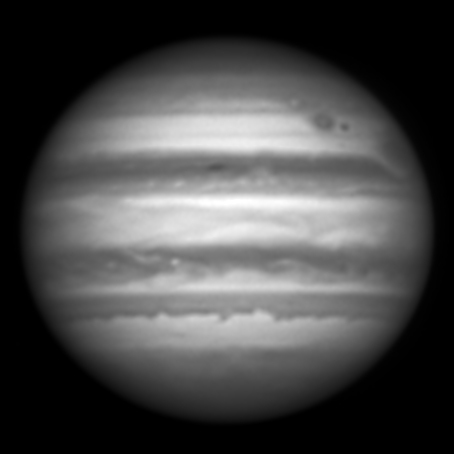 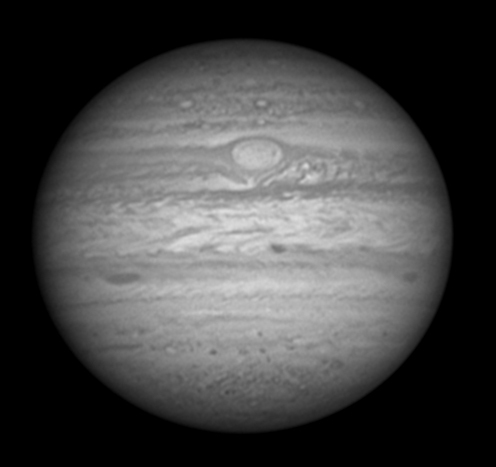 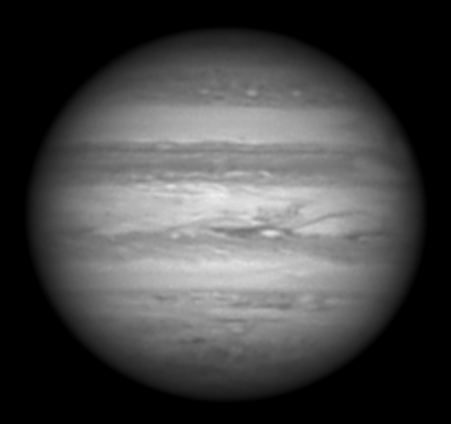 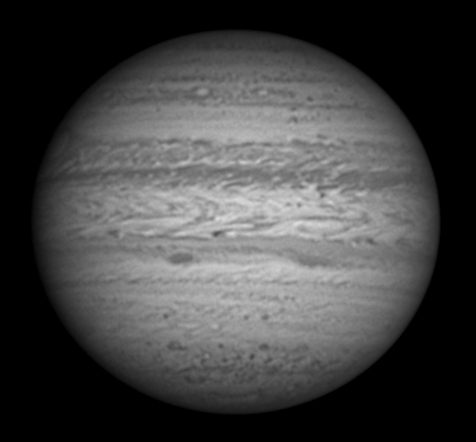 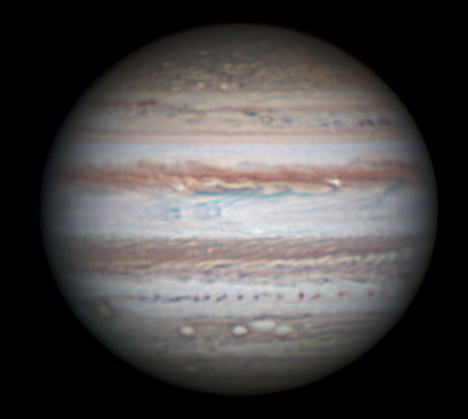 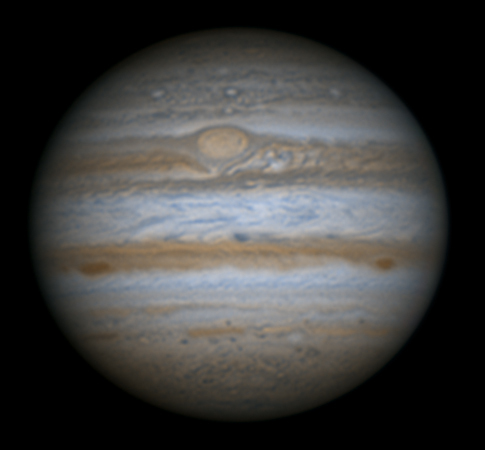 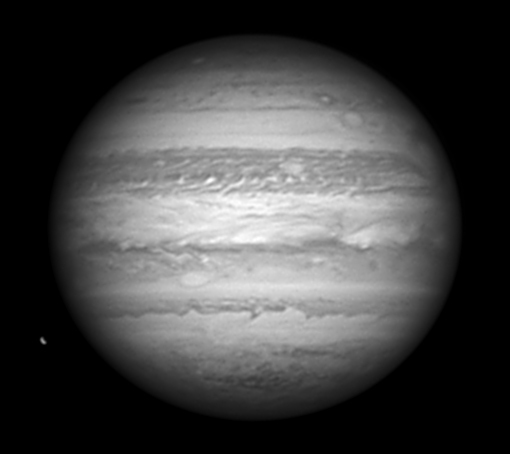 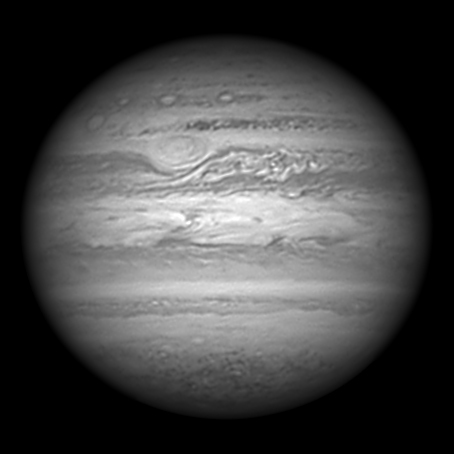 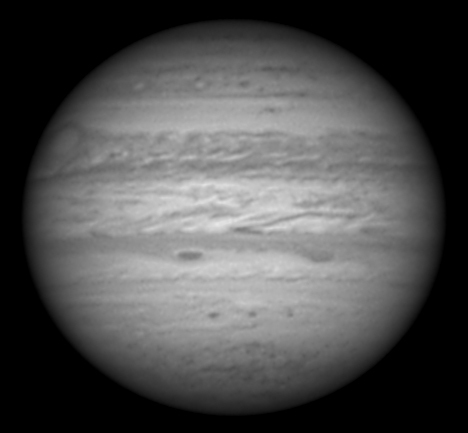 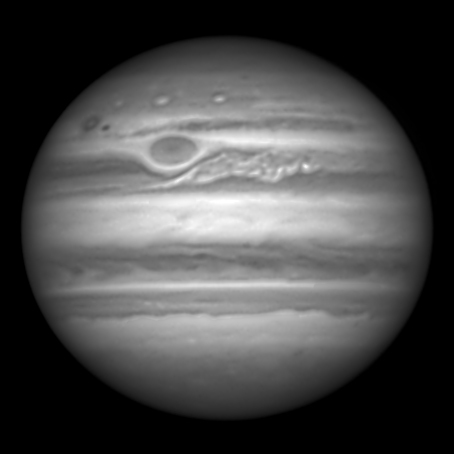 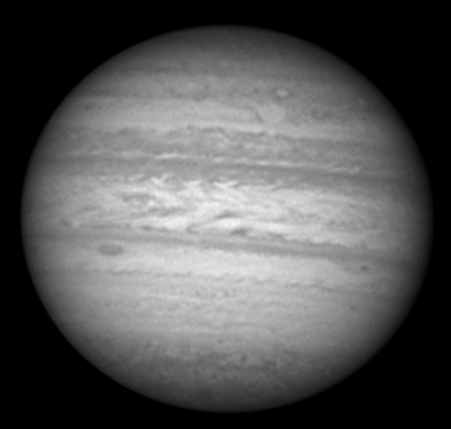 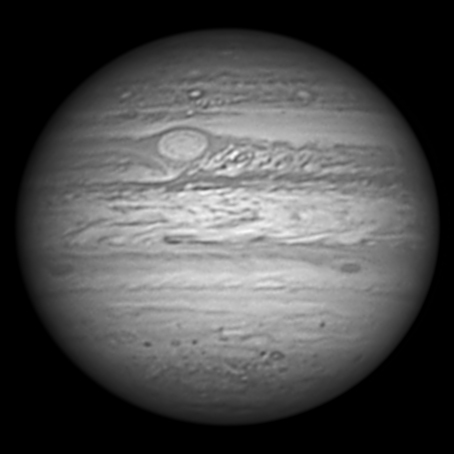 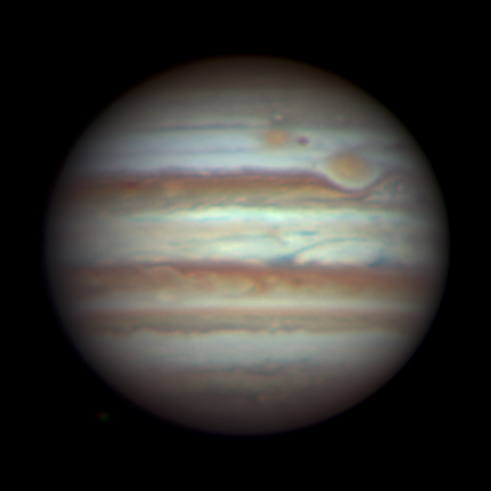 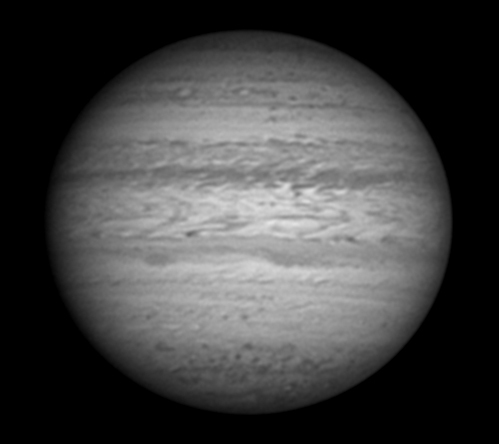 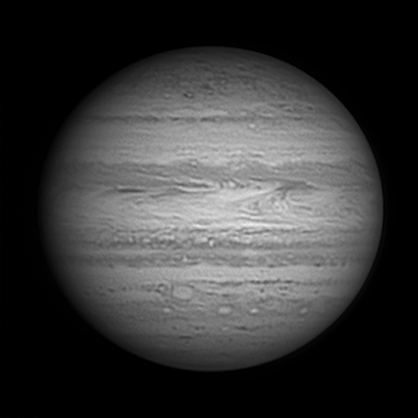 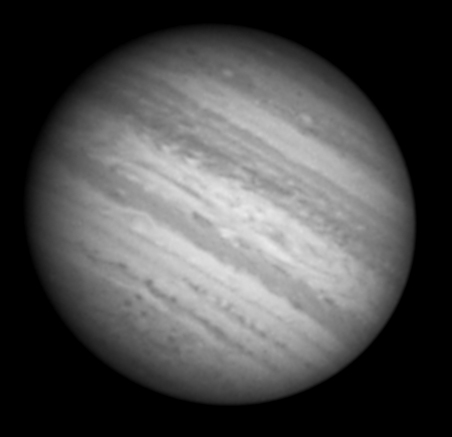 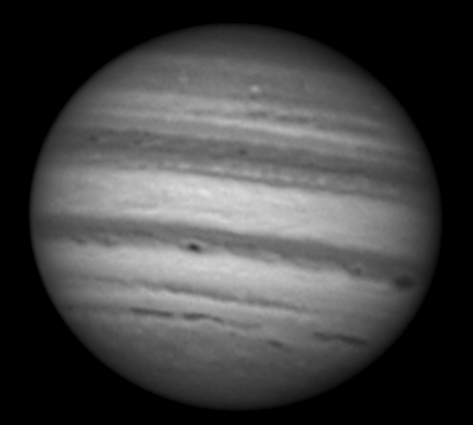 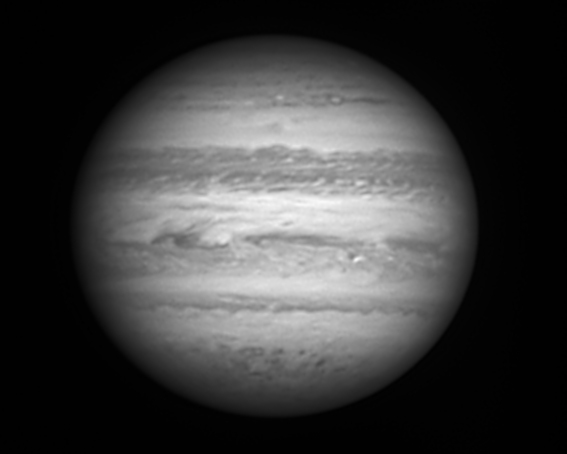 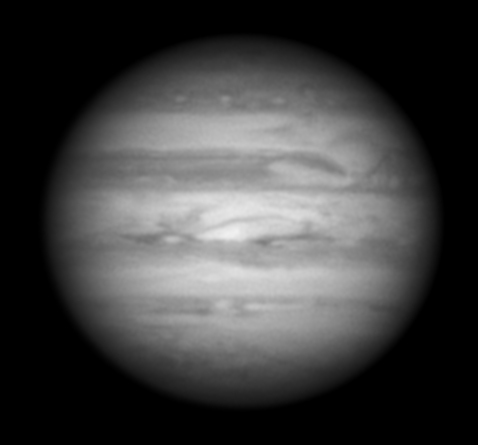 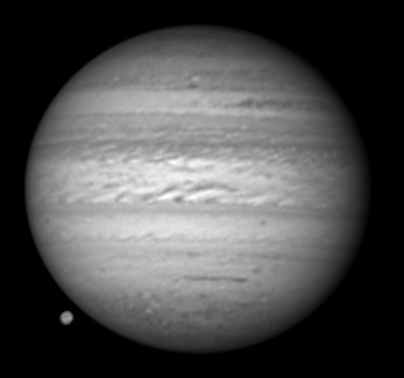 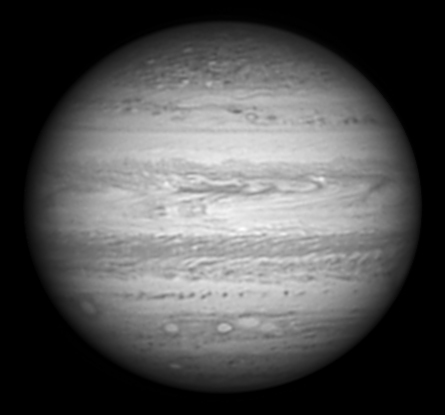 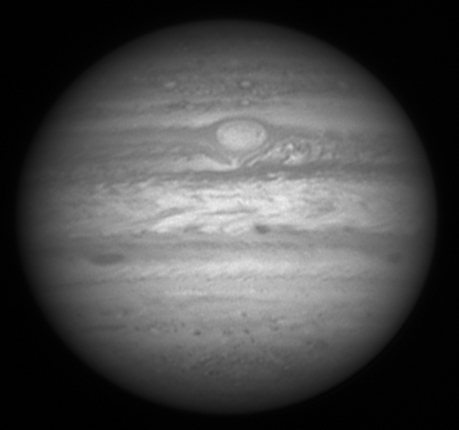 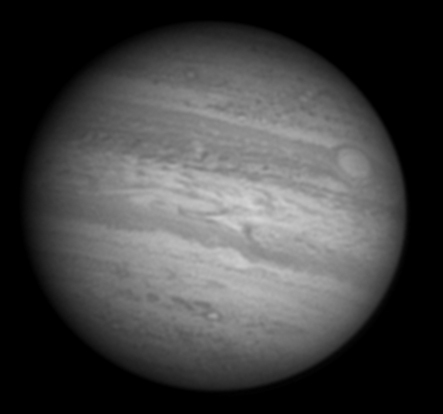 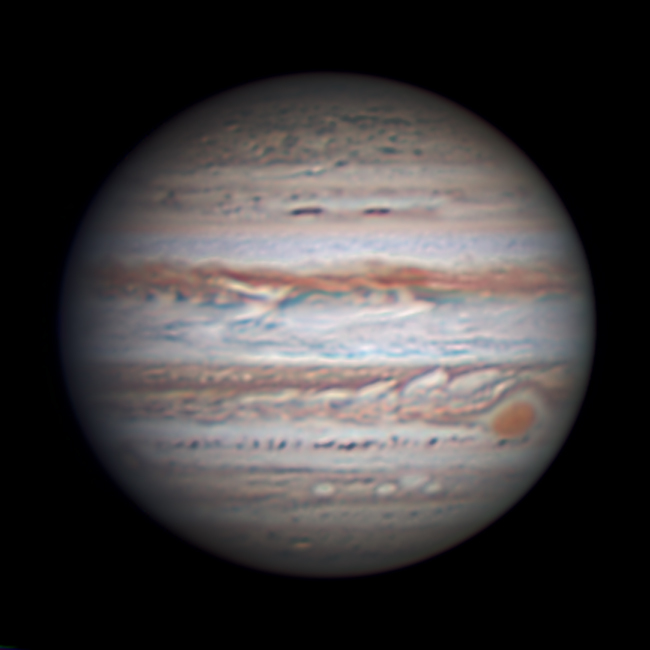 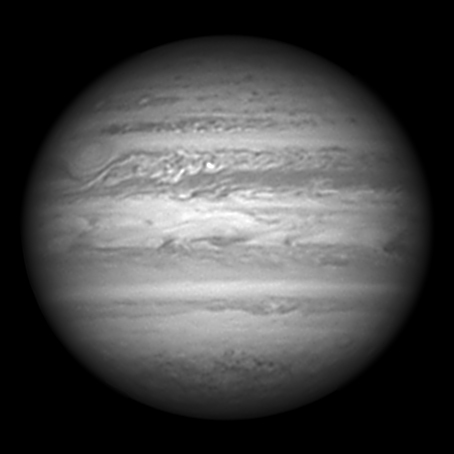 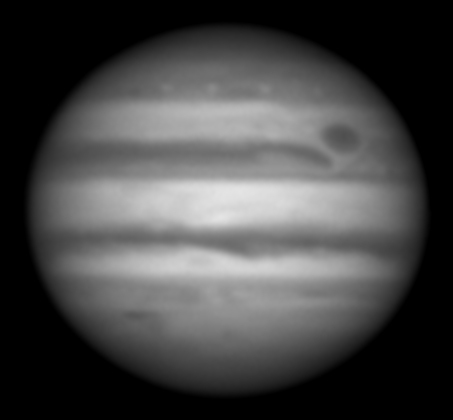 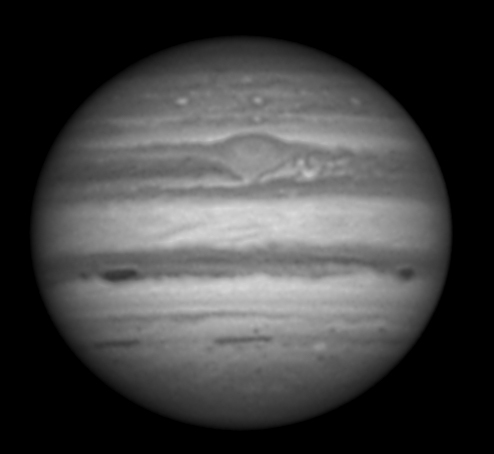 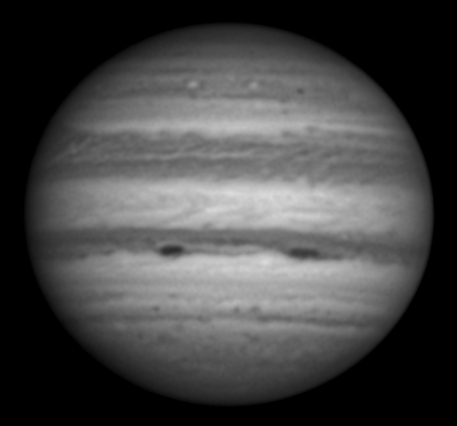 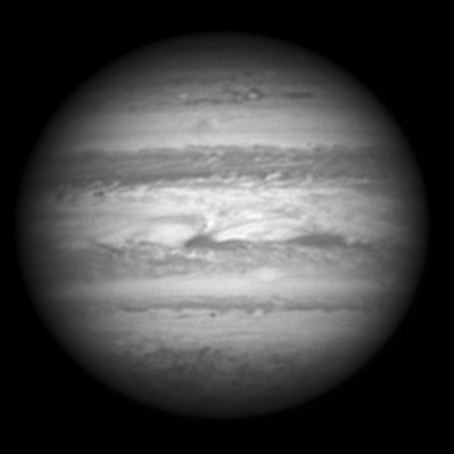 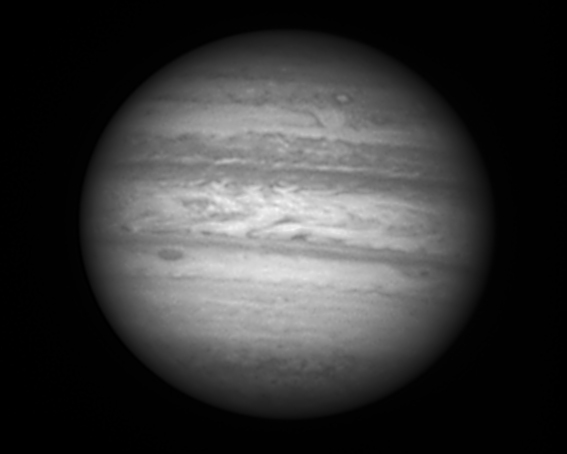 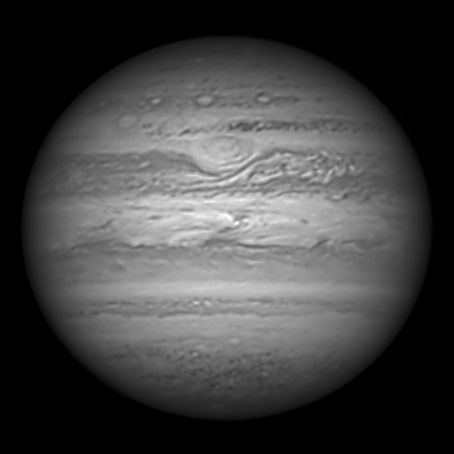 Notice spot near edge at "2 o'clock"
Great Red Spot just vanished around the western limb of Jupiter. Great Red Spot disappearing around the left hand edge. Look how dark the barges are in the blue image! 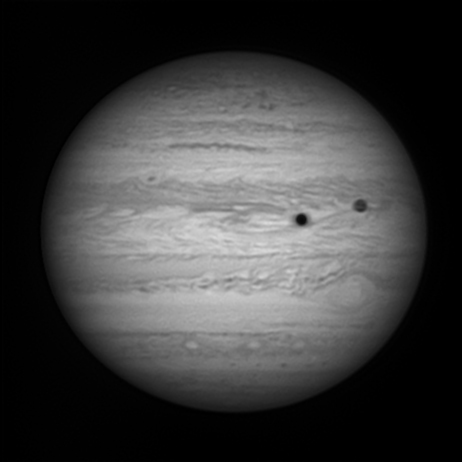 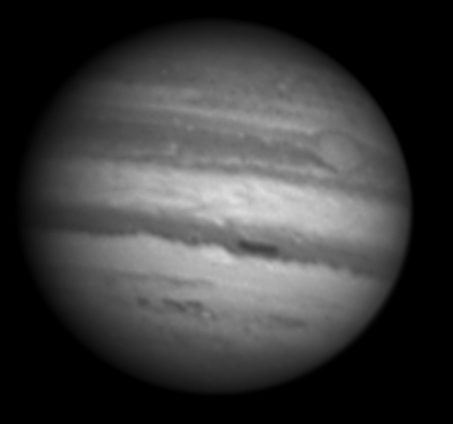 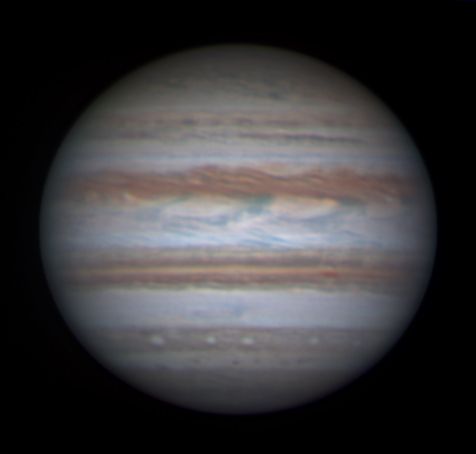 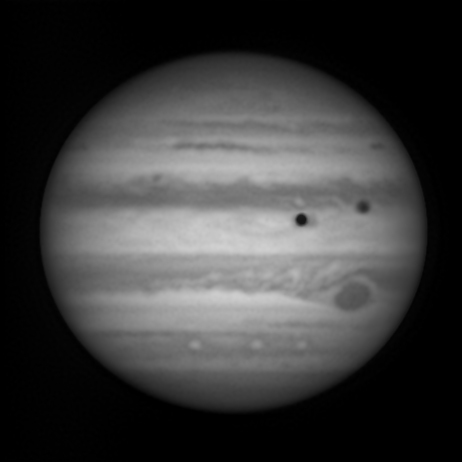 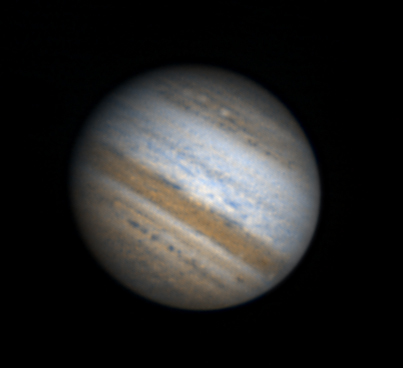 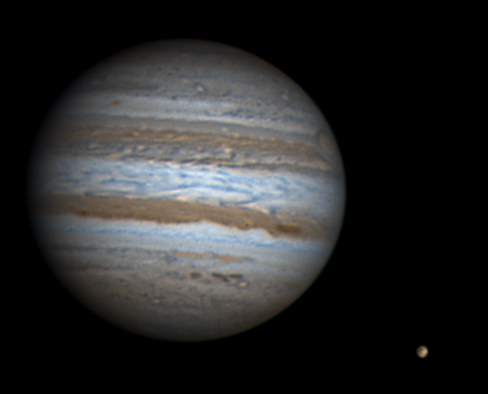 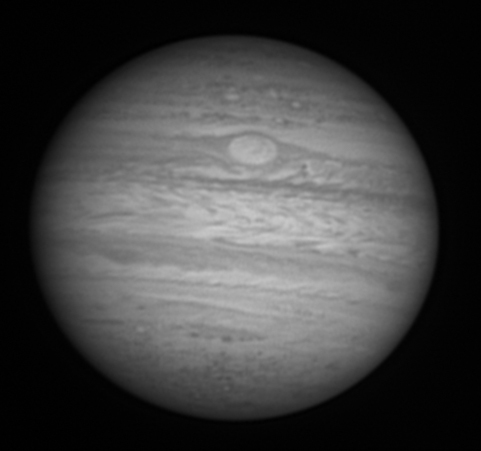 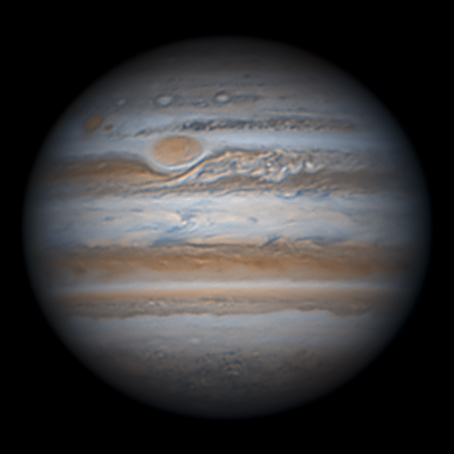 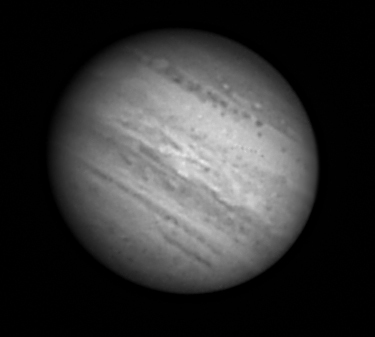 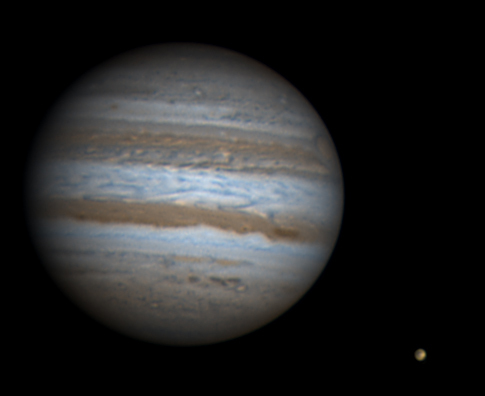 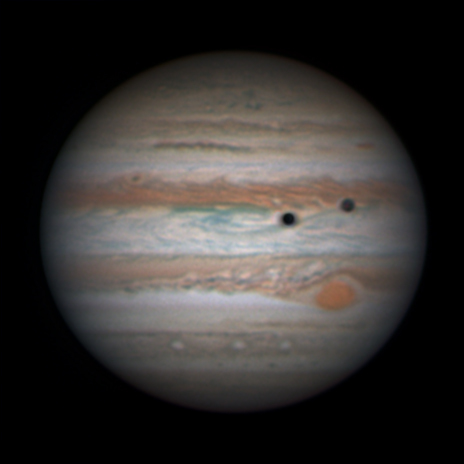 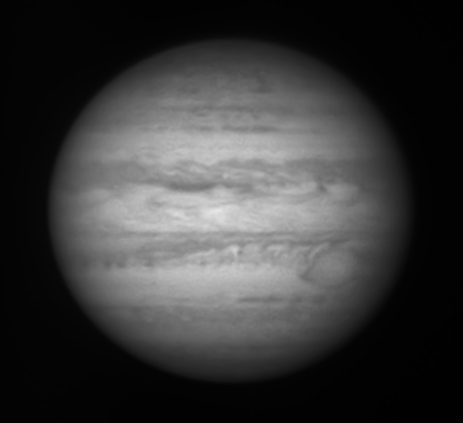 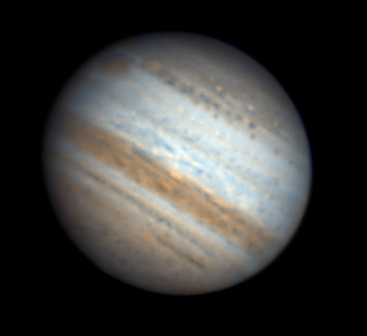 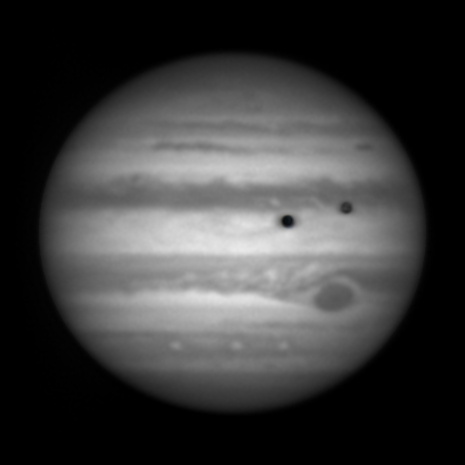 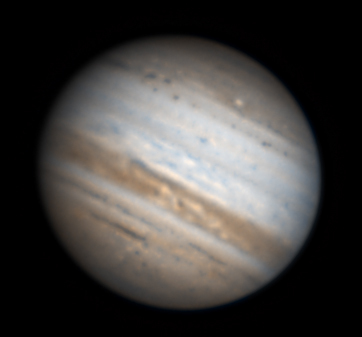 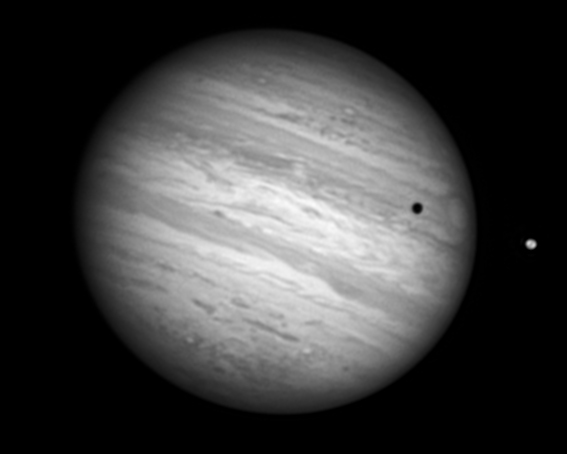 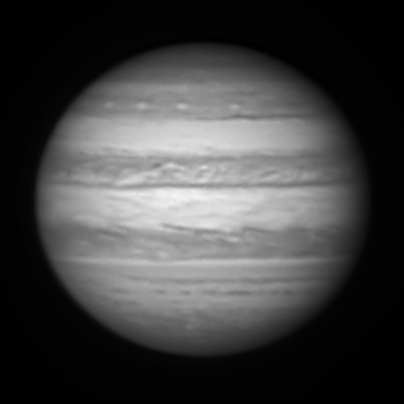 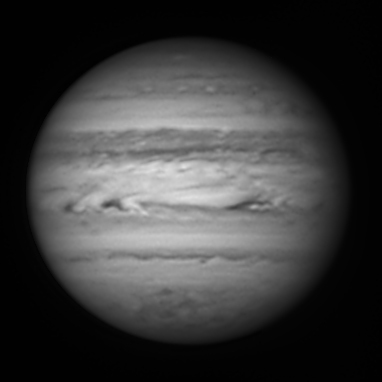 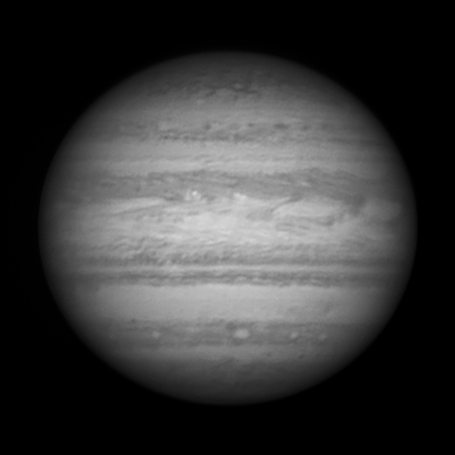 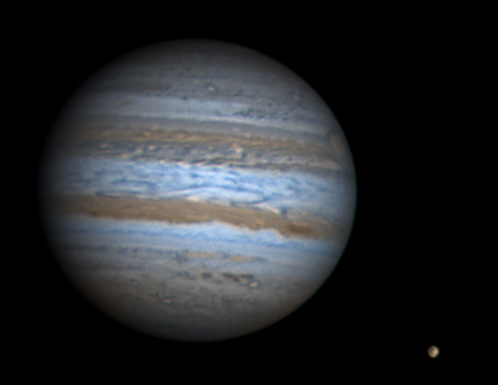 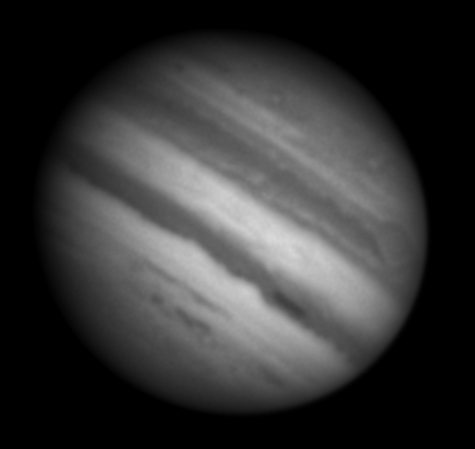 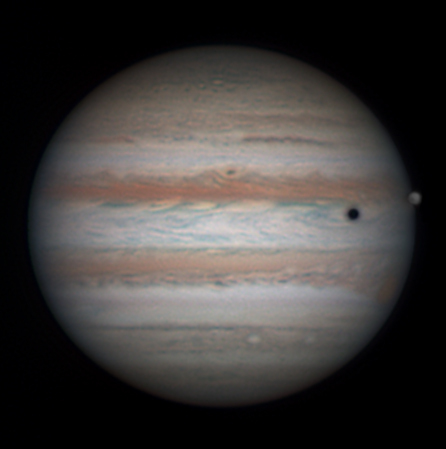 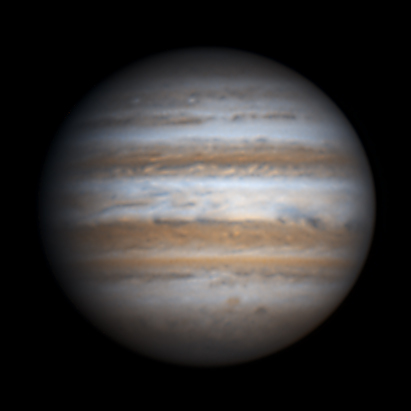 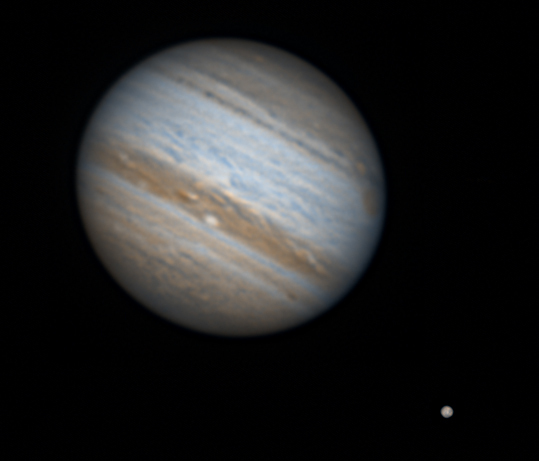 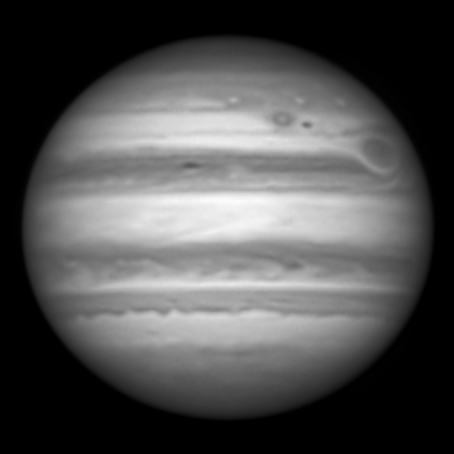 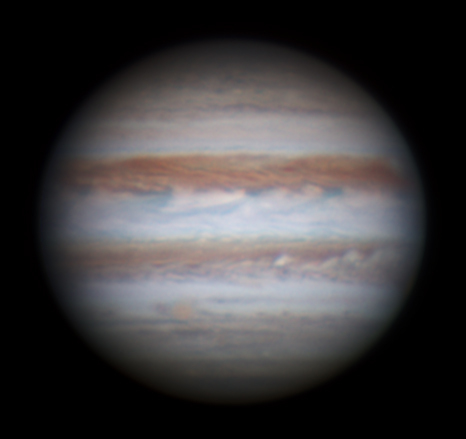 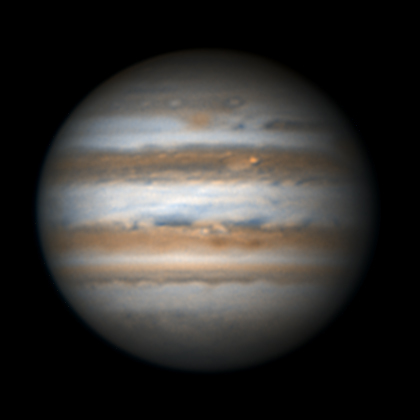 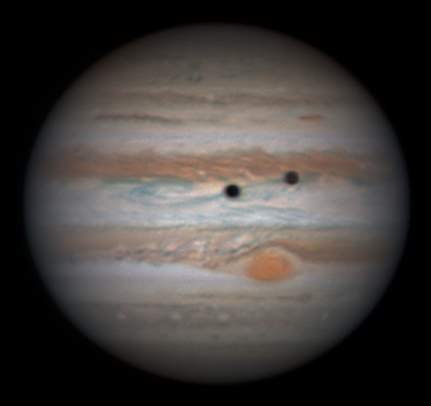 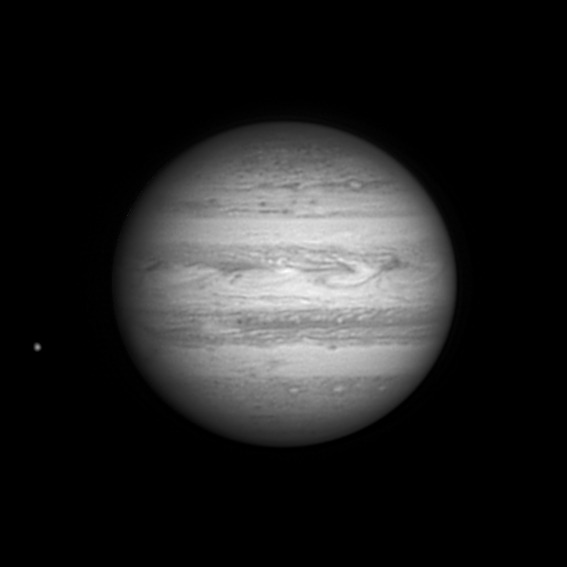 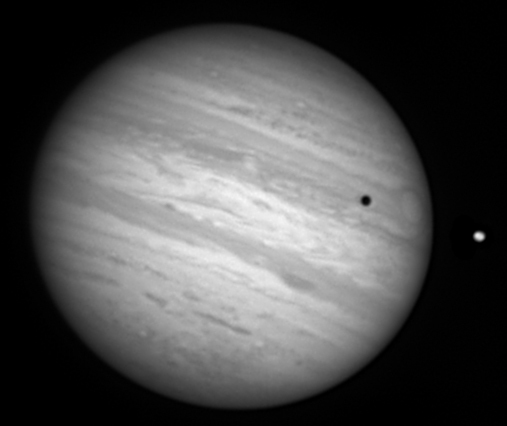 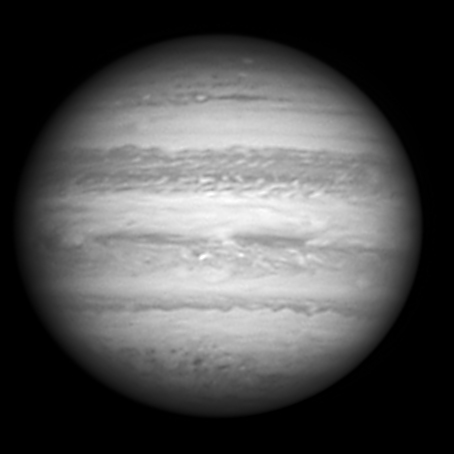 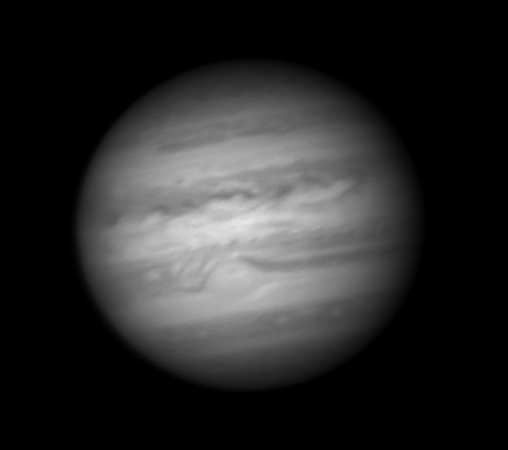 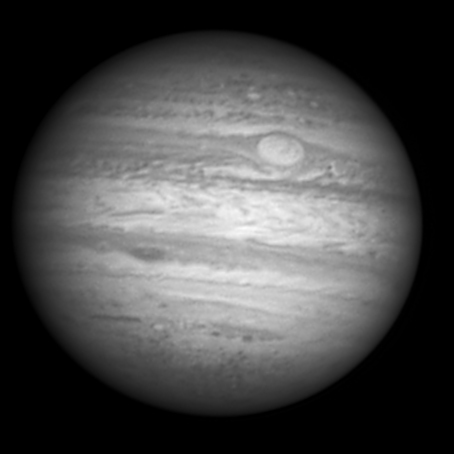 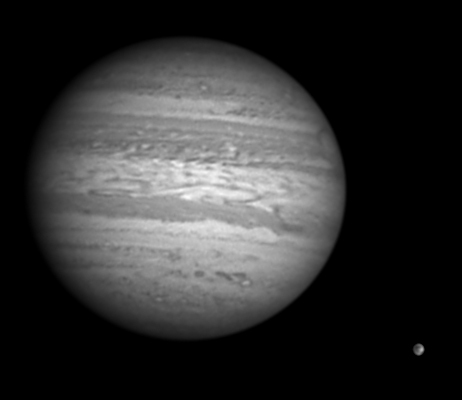 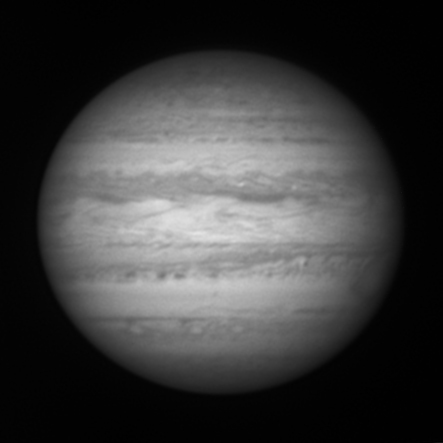 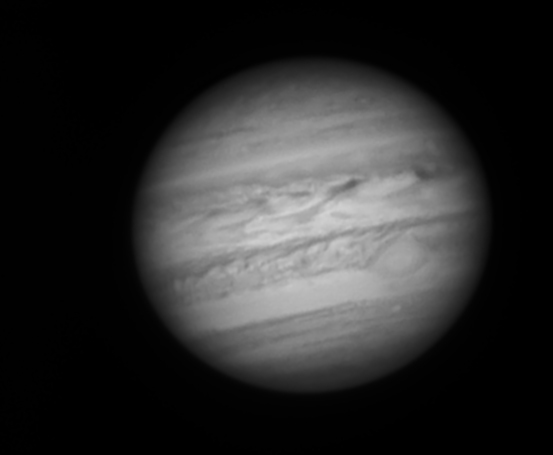 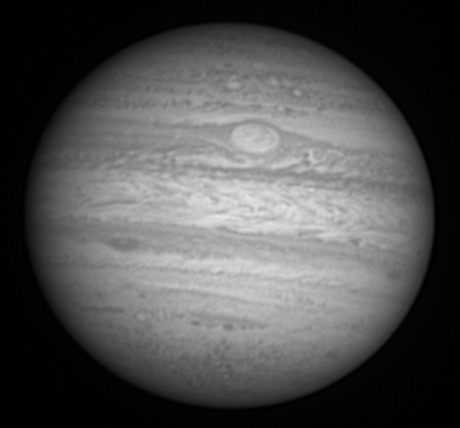 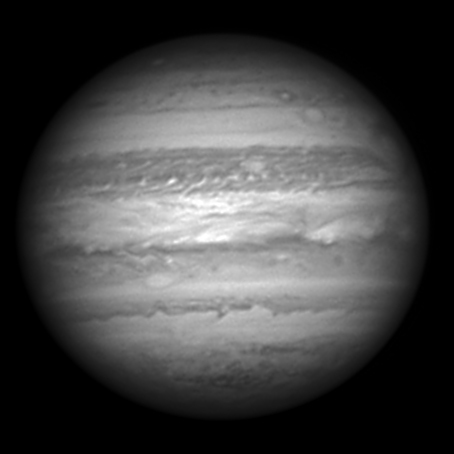 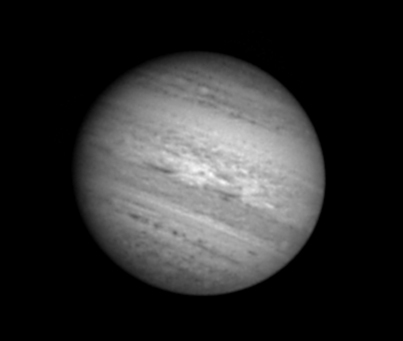 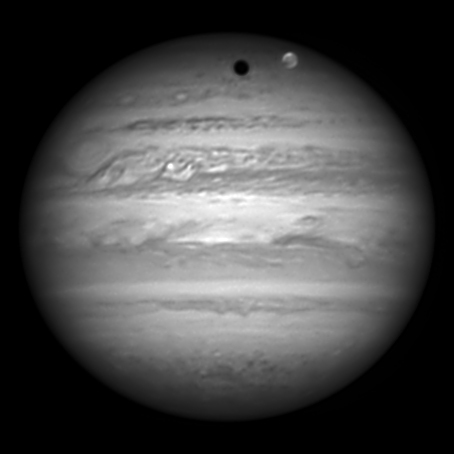 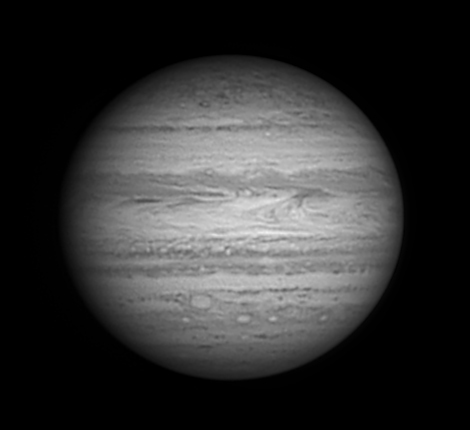 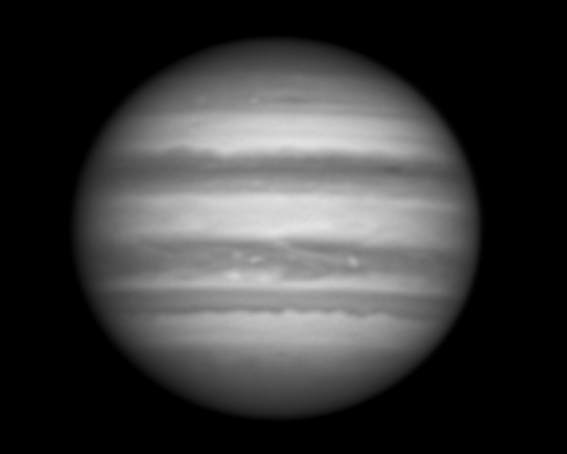 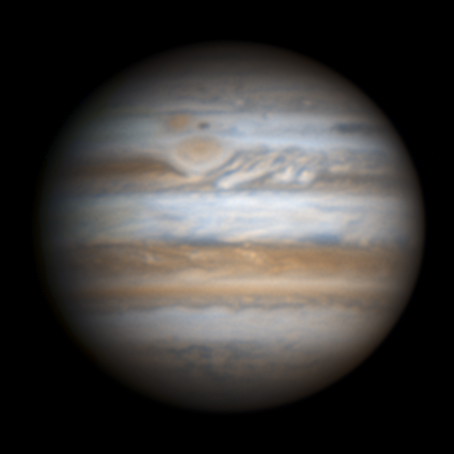 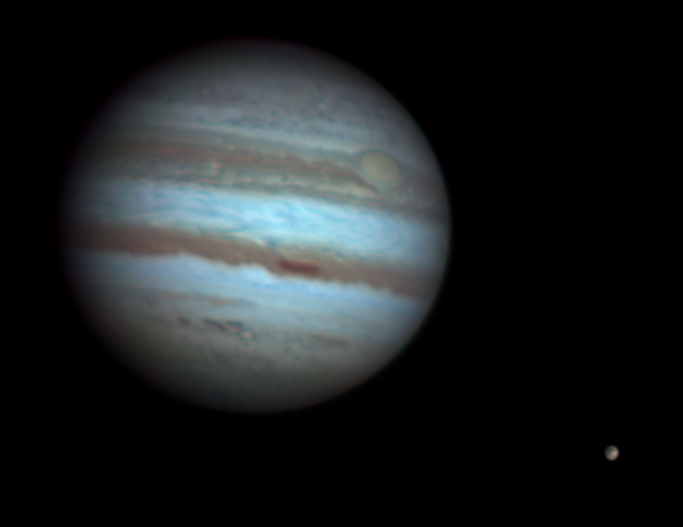 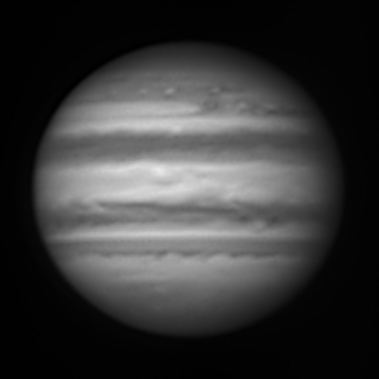 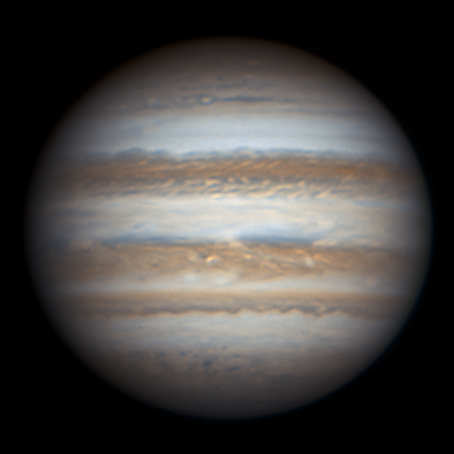 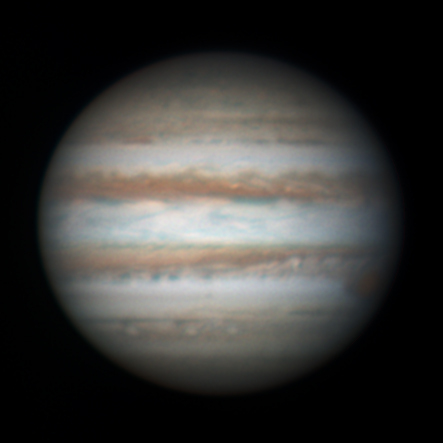 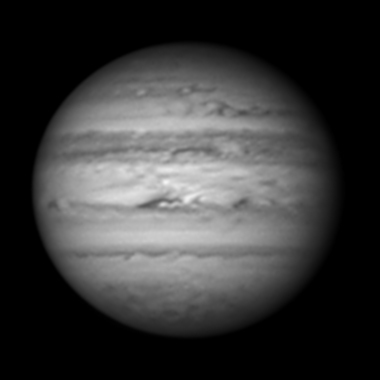 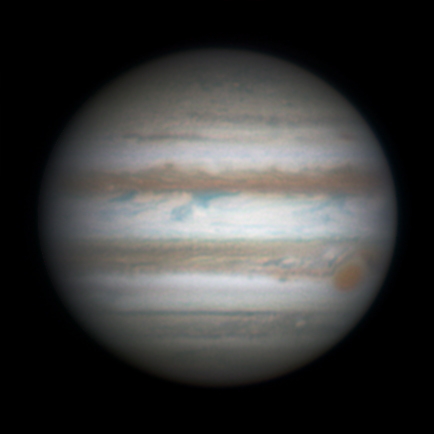 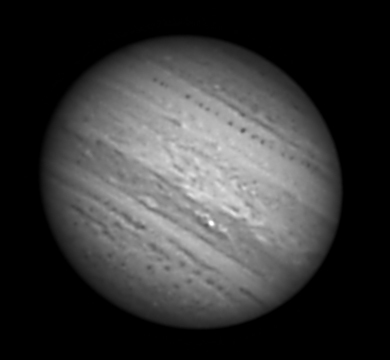 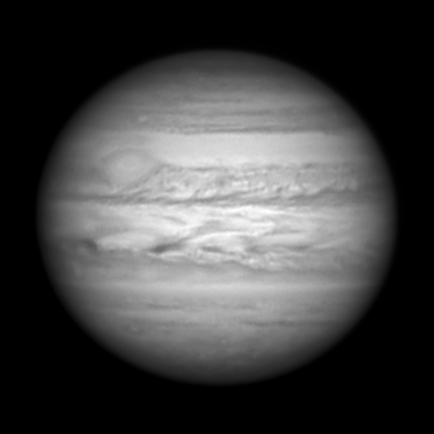 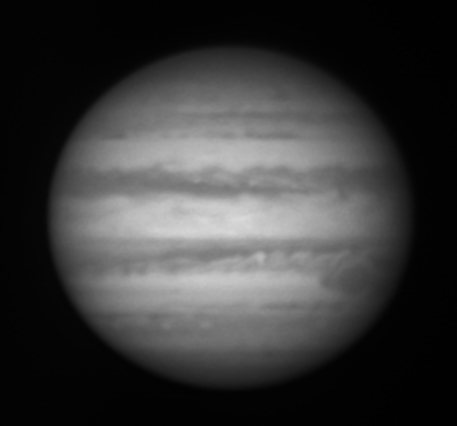 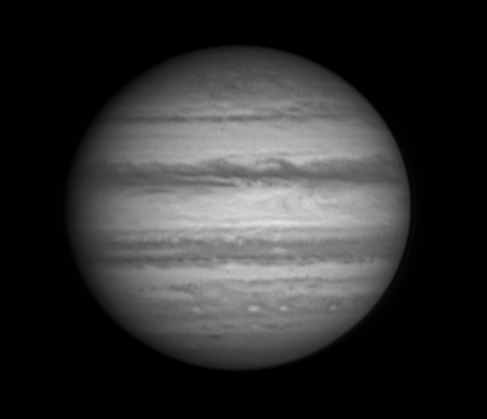 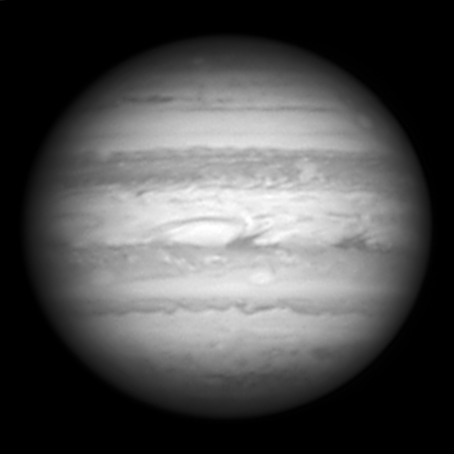 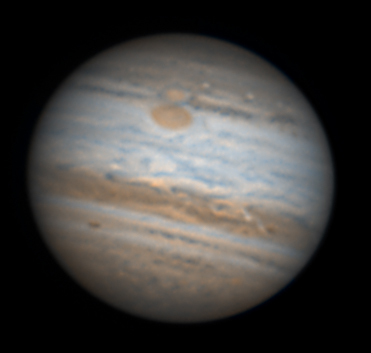 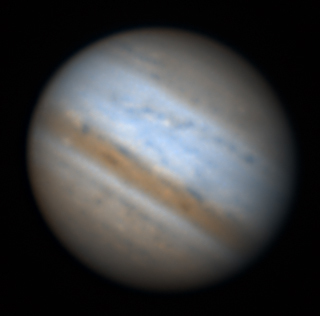 Reprocessed version using AutoStakkert and WinJupos. separate R, G, B then R[G]B centred on 02:48.0UTC. 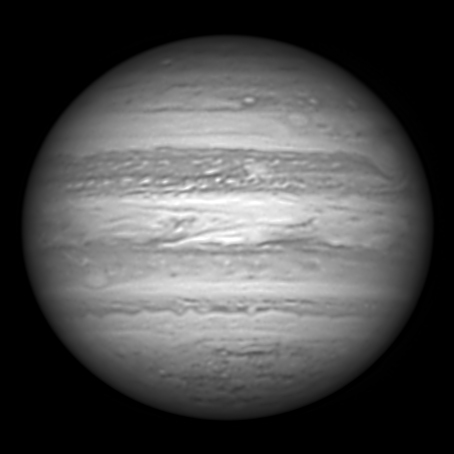 using winJUPOS: centre time = 02:45.4 UTC. 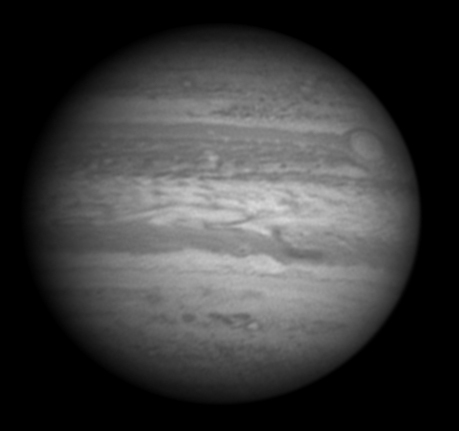 Great Red Spot approaching western limb of Jupiter. 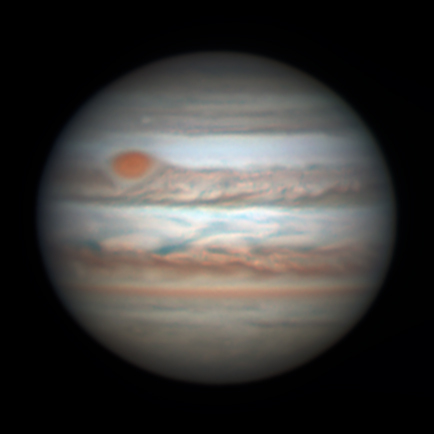 Great Red Spot near central meridian. 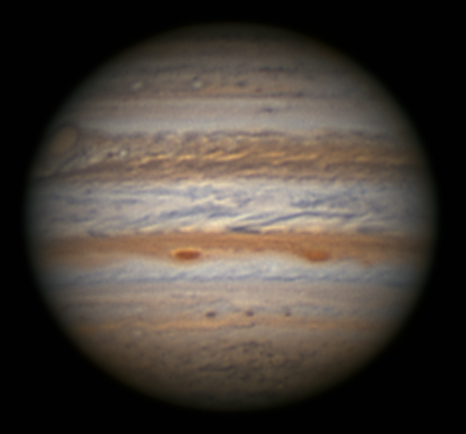 Great Red Spot almost at the CM. 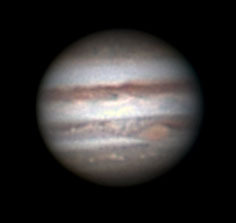 Great Red Spot approaching C.M. 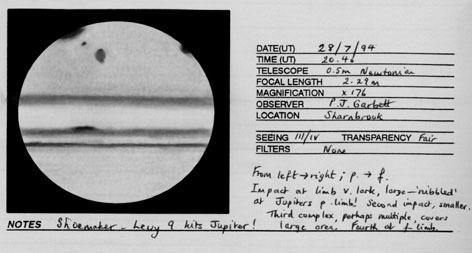 individual I and G channels shown above. 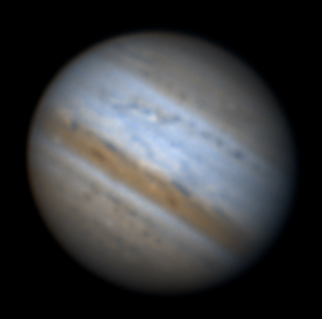 R =05:01 UTC; G = 05:03 UTC; B = 05:02 UTC; RGB. 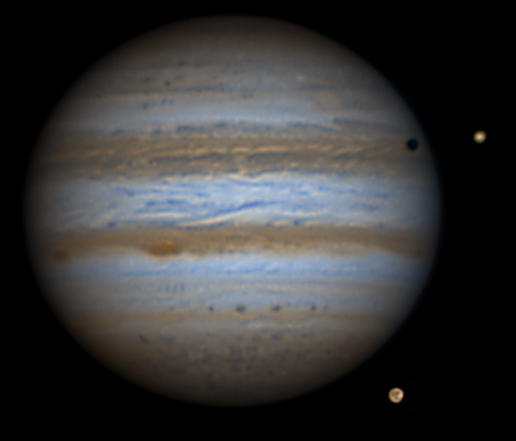 Two versions of R and one of B shown also. 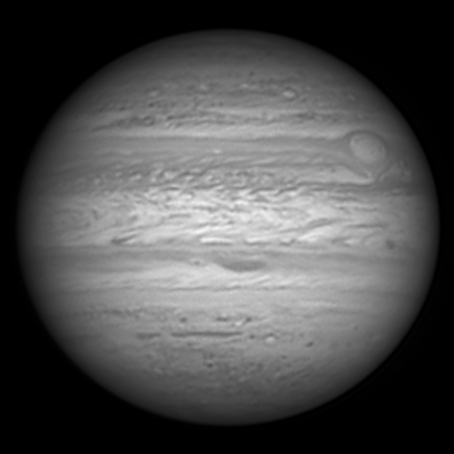 R =04:17 UTC; B = 04:18 UTC; R[G]B.
R =04:16:40 UTC; B = 04:18 UTC; R[60%]R[G]B.
R = 22:45 UTC; B = 22:46 UTC; R[G]B. Ganymede enlarged x8. R = 00:03 UTC; B = 00:04 UTC; R[G]B. Separate R and B images beneath. 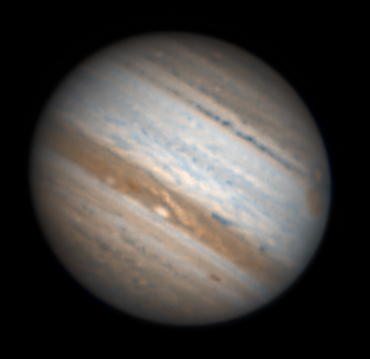 R = 00:02 UTC; B = 00:01 UTC; R[G]B. 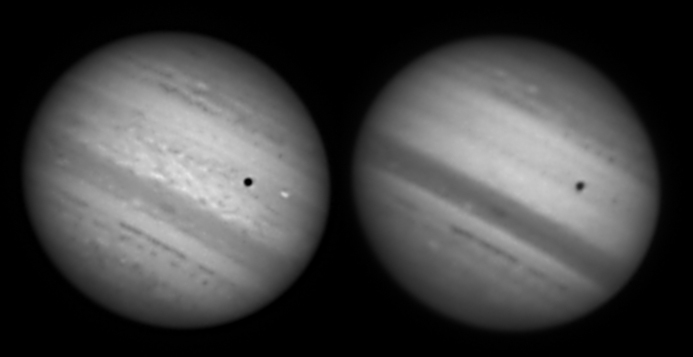 Separate R and B images beneath. 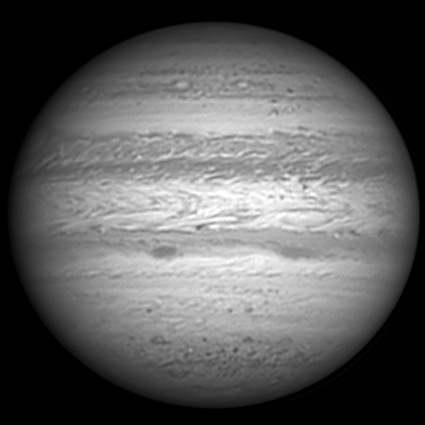 R = 01:06 UTC; B = 01:07 UTC; R[G]B. Separate R and B images beneath. 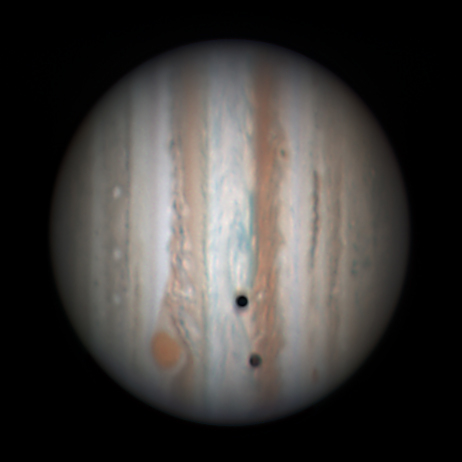 Jupiter with dark spot and adjacent light spot in SEZ: a hint of an SEB revival? 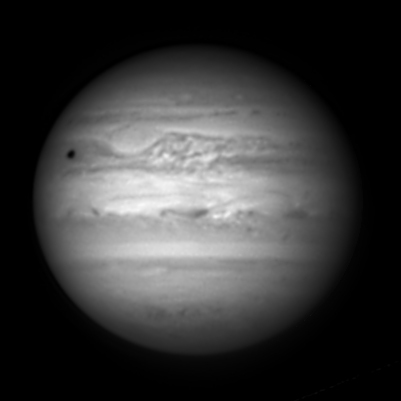 of dark streak in NPR, virtually on CM towards bottom of colour image. A challenging observation with Jupiter only 19.5 deg. altitude in a bright sky! 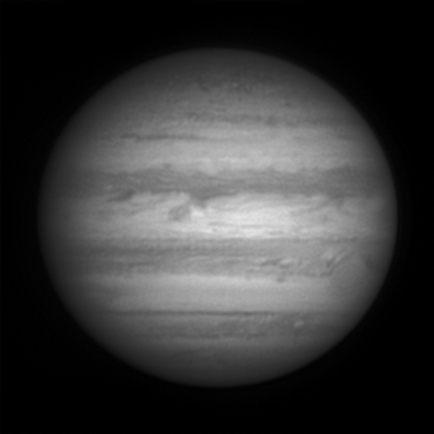 30cm Meade LX200 SCT @ F23.